"Hi, is there any way to convert PPTX to video free? I have used Windows PowerPoint to create a PPTX presentation and want it to be saved in video so I could directly view PPTX presentation content on my iPhone and upload it to my blog. 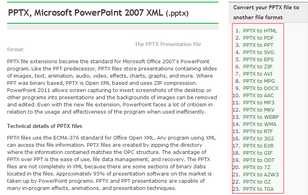 I know that PowerPoint could export PPTX file to MP4 and WMV videos. But the exported file couldn’t play on my iPhone. Please help." 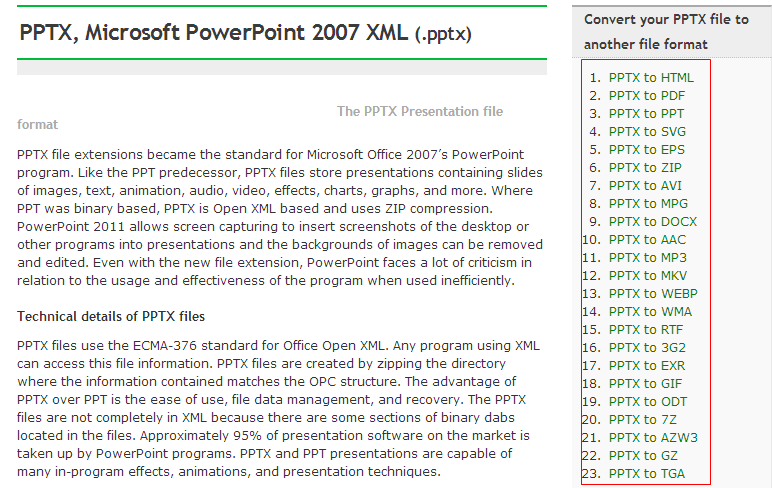 To view PPTX files on iPhone or other mobile devices, you could just install Microsoft PowerPoint Mobile. This app has multiple versions for corresponding platforms. However, if you want to upload PPTX files to blog or YouTube for sharing, you need to convert PowerPoint to video files that could be accepted by blog or YouTube. If you’re looking for a solution to convert PPTX to videos in different formats for multiple uses, this guide satisfies you well with different effective solutions. 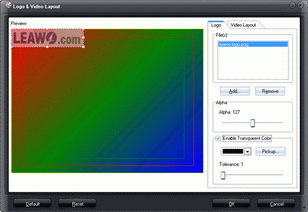 You could make use of free PPTX to video converter online to convert PPTX to video online free. The best online PPTX to video converter free tested is Online-Convert.com. It includes multiple online media converter services. 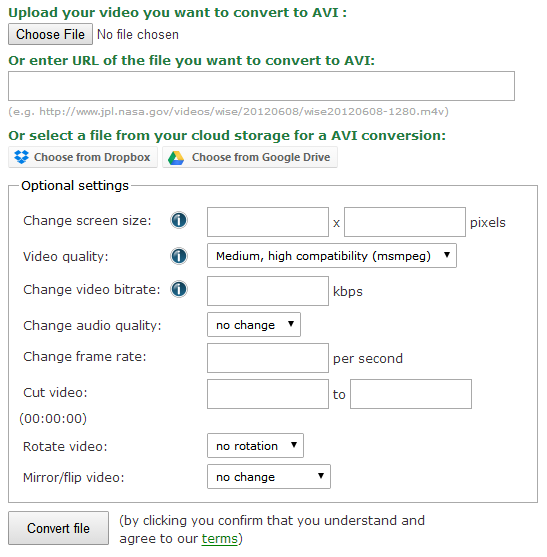 The below guide would show you how to convert PPTX to video online free. 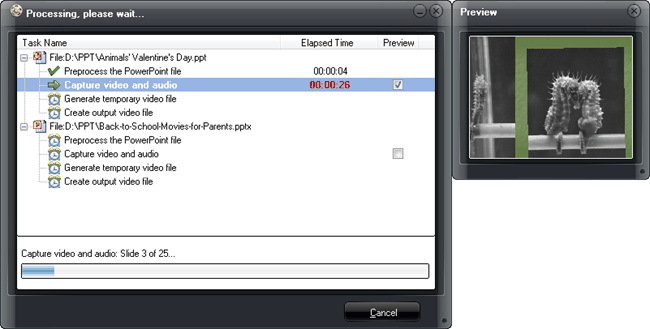 Click the above link to open the free online PPTX to video converter page. On the right side, you could see multiple categories, select the one you want, like PPTX to AVI or PPTX to FLV according to your personal needs. On the popup page, click the "Choose File" button to browse and select PPTX file from your computer. You could also directly enter URL of your PPTX file, or select PPTX file from your cloud storage for converting. After adding source PPTX file, complete the "Optional settings" according to personal needs (The free online PPTX to video converter would automatically determine for you if you don’t complete these settings). After all these settings, click the "Convert file" button. This online free PPTX to video converter would start to convert PPTX to video online free. 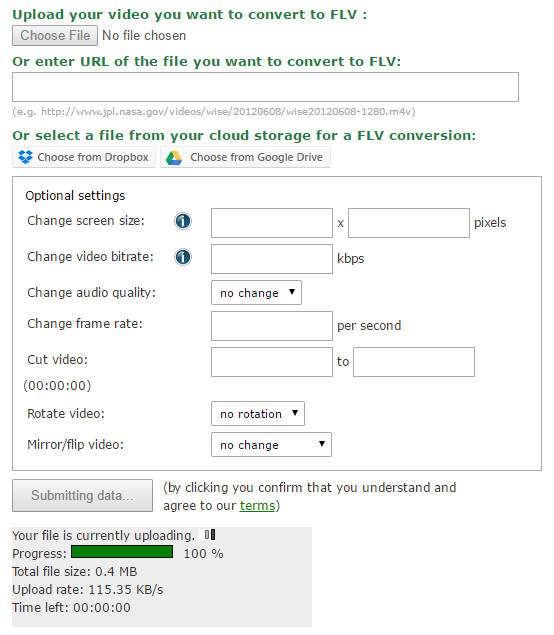 After converting, this free online PPTX to video converter would automatically lead you to the download page. 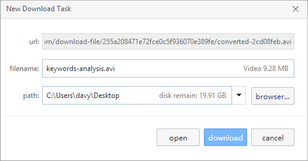 On the newly popup "New Download Task" window, get it a file name and set the path for saving output video file. Then click the "Download" button to start downloading. In this way, you could freely convert PPTX to video online free without any charge. Make sure you have wonder Internet connection. After converting, you could use the converted PPTX file in your own way. 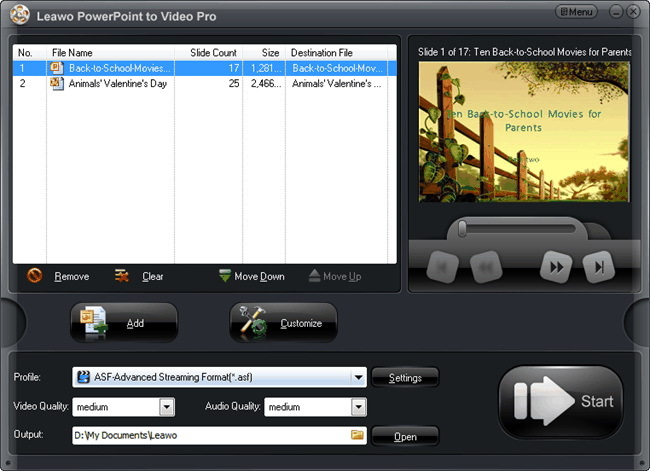 Another solution to help you convert PPTX to video is to make use of desktop PPTX to video converter software like Leawo PowerPoint to Video Pro, the best PPTX to video converter that helps you convert PPTX to video in 180+ formats like MP4, FLV, AVI, MOV, F4V, etc. 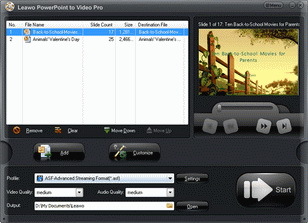 With this PPTX to video converter, you could convert PPTX to MP4, PPTX to AVI, PPTX to FLV, etc. for multiple purposes. 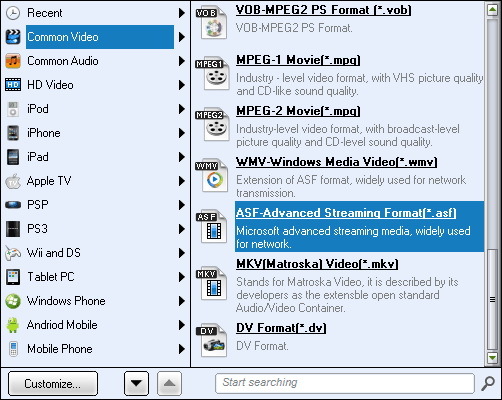 Different from online PPTX to video converter freeware, Leawo PowerPoint to Video Pro could convert PPTX to video in batch, allow you to change output format according to target media player and device, enable you to edit PPTX files before converting, etc. 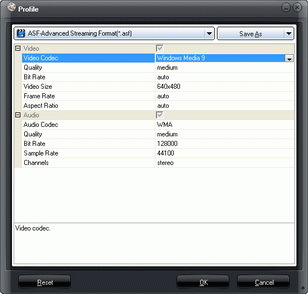 Click the "Add" button on the main interface to browse and add PPTX file(s) into this PPTX to video converter. You could add as many PPTX files as you like. After adding, you can play back loaded PPTX files. Move mouse to the drop-down "Profile" box and click it. On the popup window, set output format from "Common Video" group or directly select from target device group. Click the "Output" box to select a folder on your computer as output directory. 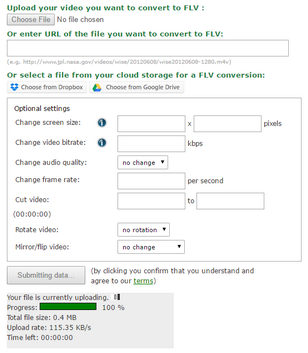 (Optional) As you need, click the "Settings" button next to the drop-down "Profile" box to adjust video codec, bit rate, video size, aspect ratio, frame rate, audio codec, channel, etc. (Optional) You can click the "Customize" button to edit PPTX files: set PPTX transition time, add PPTX background music, adjust audio effect, change aspect ratio, apply watermark, etc. 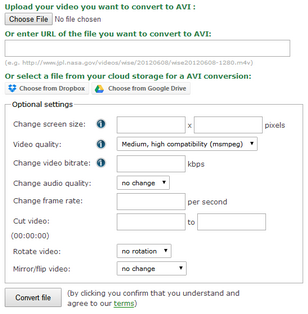 Finally, click the "Convert" button at the bottom right corner to start converting PPTX to video.